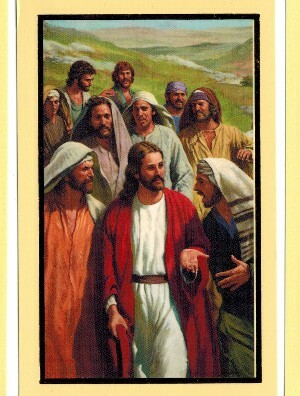 prayer on back/paper card stock Prayer of Priests and Religious O Jesus, friend and master, You have called me to follow You. You have asked me to help You feed Your sheep and to bear Your cross, I have heard Your call. My only joy is to serve You My food is the bread of angels. My shelter is Your loving heart. My rest is to do Your will. Bless those I have left behind and fill their hearts with peace. Give me courage, strength, patience. and holy purity so that I may serve You in all that I do and say as long as life is in me. Amen. size 4" by 3"